In 2004, Bob Moss founded Moss & Associates with two projects and two employees. Today, Moss is a privately held construction firm providing innovative solutions resulting in award-winning projects across the United States with more than 600 professional employees. Bob built his successful career during the past 49 years with experience in a diverse portfolio of construction projects spanning North America. This portfolio includes transportation projects, healthcare facilities, military and space research projects, retail, universities and higher education, correctional facilities, sports facilities, solar construction, island construction, residential multi-family units, senior housing facilities and convention centers. Some of his hallmark projects include Marlins Park and Nova Southeastern University’s Guy Harvey Oceanographic Center. Bob was also central to the teams that constructed 10 Walt Disney World resorts which included approximately 22,000 rooms; 16 Bass Pro Shops/Outdoor World projects; the Mayo Clinic in Rochester, Minnesota; Atlantis Paradise Island and Our Lucaya in the Bahamas. Bob’s experience continues with iconic projects such as Brightline Ft. Lauderdale and West Palm Beach stations, Margaritaville Vacation Club by Wyndham in St. Thomas, USVI, Auburge residences in Fort Lauderdale, Florida International University’s Wellness and Recreation Center, ICON Las Olas and the BB&T Center. 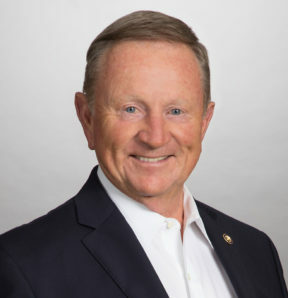 Bob serves on the Governor’s Florida Council of 100, World President Organization, the Chief Executive Organization, and he is the Vice Chairman on the Board of Directors of Watsco, a $7 Billion NYSE Company. He has been honored by his peers and the community: Nova Southeastern University’s Huizenga College of Business and Entrepreneurship Hall of Fame Inductee, University of Florida Construction Hall of Fame, Clemson Construction Hall of Fame, Broward Workshop’s Top 102 CEOs. In 2011, he was the recipient of the South Florida Council, Boy Scouts of America’s Distinguished Citizen Award, and he was recognized as the Humanitarian of the Year by the EASE Foundation in 2012.